KIEV, Ukraine -- President Donald Trump must rebuke Russian President Vladimir Putin for election interference and global aggression after the news of the 13 indictments (“Feds charge 13 Russians with meddling in 2016 election,” Web, Feb. 16). Mr. Trump was telling the truth all along. His Democratic accusers lose big. 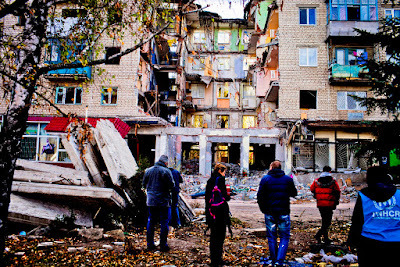 Russia has caused a humanitarian disaster in the middle of Europe by attacking Ukraine and occupying a part of it since February 2014. The disaster has been made worse by the refusal of some Western countries to stop Russian aggression. The now-full-blown war started by Russia has killed over 14,000 Ukrainian soldiers and wounded over 50,000. Ukraine now has over 1.6 million internally displaced persons. In early 2017 Germany announced it would spend 2.3 million euros to help the refugees — but that is merely one euro and 44 cents per person, an insignificant amount. Germany does not fight against Russian troops along with Ukraine’s defenders. It provides no lethal arms to defend Ukraine, nor does it participate in the international military training mission at Vavoriv to help Ukraine defend Europe. Ukraine stopped the Russian invasion of Europe in Crimea and Donbass without any significant help from western countries, and it is dealing with its 1.6 million refugees by itself. The best way forward for western allies is to liberate occupied Ukraine from the foreign Russian invaders and provide massive Marshall Plan aid to Ukraine to help the internally displaced return to their homes. Europeans who are not helping Ukraine are helping Putin stay in power.